This story was updated at 10:14 p.m. ET. China is readying the rocket that will carry the country's first prototype space laboratory into orbit Thursday (Sept. 29). Officials at the Jiuquan Satellite Launch Center in Northwest China have fueled the Chinese Long March 2FT1 rocket that will blast the unmanned Tiangong 1 module into space. The launch is slated to occur between 9:16 p.m. and 9:31 p.m. local time at the launch site (Thursday morning in the United States), according to state media reports. The space lab module is 8.5 metric tons (9.4 short tons), and is 34 feet (10.4 meters) long and 11 feet (3.35 m) wide. Tiangong 1 is designed to spend two years in space before its mission is complete, Chinese space officials said. "All the preparatory works before launching are finished," China's Manned Space Engineering office spokeswomanWu Ping told reporters at the launch site, according to a translation provided by the office. The prototype was originally set to liftoff earlier this week, but a forecasted cold weather front forced mission controllers to push the targeted launch date, according to state media reports. China is expected to launch three additional spacecraft at a later time to connect with Tiangong 1 in space. The unmanned Shenzhou 8 mission is due to launch in early November to conduct the first docking tests between two Chinese spacecraft. 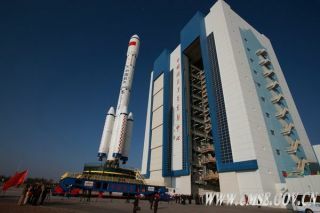 The country then plans to launch the Shenzhou 9 and Shenzhou 10 to robotically attach to the Tiangong 1 module. "The main tasks of [the] Tiangong 1 spaceflight include: to provide a target vehicle for space rendezvous and docking experiment; to primarily establish a manned space test platform capable of long-term unmanned operation in space with temporary human attendance, and thus accumulate experiences for the development of the space station; to carry out space science experiments, space medical experiments and space technology experiments," Wu said.